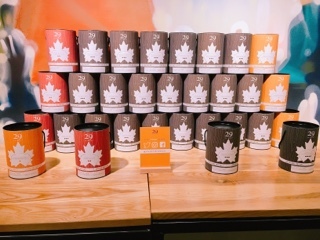 Thoughts of maple syrup, for me, always revolved around its taste (a rich complex sweetness), how it’s made (collecting the sap of maple trees during cold months and painstakingly boiling it until it reduces many times over), or its tie-in to Canadian cuisine. Then, in February, 29 Février held an event to launch their Don’t Forget the Date campaign - the occasion now adds fighting Alzheimer’s to the mix. 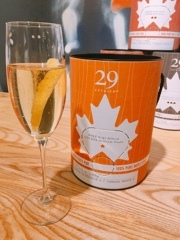 Although studies researching the prevention benefits of the sweetener is still beginning (in 2016 two studies found maple syrup extract prevented damages to certain proteins found in brain cells), purchasing maple syrup from 29 Février will benefit the cause: 5% of Maple-in-a-Tree product sales will be donated to the Canadian Alzheimer Societies. François Décarie, 29 Février’s President, was inspired to support the cause after his mother was affected by the disease. He recognized the toll it has on their loved ones, leaving him wanting to do something to give back. My own grandmother has recently been touched by Alzheimer’s, although, thankfully, it’s still in its infancy and she’s still able to live an independent and fruitful life. Nonetheless, hearing the diagnosis was scary and my mother and her siblings have definitely re-arranged their lives to ensure their mother has additional support. I get it, I’ve experienced it, and I’m glad Décarie’s doing something to help. 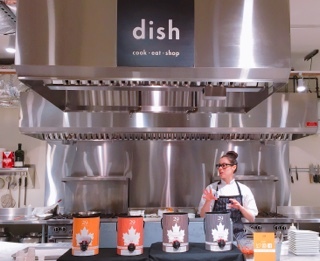 Having the launch event at DISH Cooking Studio was the ideal venue to make us think outside the pail. 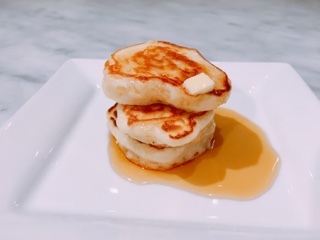 Sure, maple syrup tastes so good with desserts, but just like any other sweetener, it can be incorporated into a plethora of recipes. 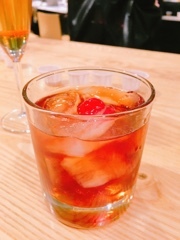 Even before we began eating, the lightest golden maple syrup made its way into the cocktails: topped with Prosecco and squeeze of lemon or added to whiskey to temper down a Manhattan. 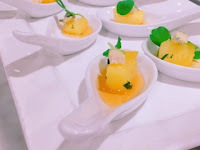 For hors d'oeuvres, it was used to caramelize pineapples and brushed onto roasted golden beets to further enhance the ingredient’s natural sweetness. 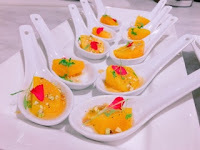 Adding savoury elements like gorgonzola and pistachio dust helped to keep the bites from getting overly sugary. 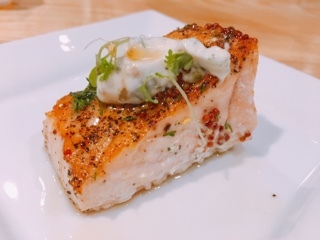 To end, Head Chef Gabriela Neda, whipped up a popular maple main: seared salmon glazed with the syrup (in this case combined with grainy mustard) and topped with a caper aioli to keep it savoury. The sweetness of the syrup just goes so well with the oily fish. 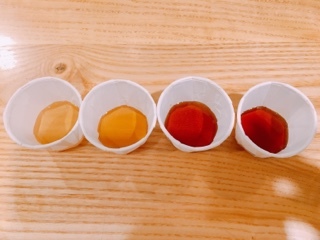 As luck would have it, the event was held on Pancake Tuesday so we also experienced the four varieties with its favourite companion. For desserts, François suggests using the amber variety that has a deeper taste, but is still light enough as to not overpower the dessert. Indeed, this is also my typical go-to syrup to have around the house. As you switch to the darker grades, the molasses taste starts to shine through followed with a lasting after taste. These are generally used to marinade meats or as a glaze on seafood but would also make a fantastic rich caramel sauce for some desserts. Having tasted the ‘very dark’ – the newest grade that was previously only sold to restaurants given the small quantities made – it has such an intense and almost earthy flavour that it’d be perfect for brisket and other heavy meats. Before the event, I assumed that darker syrups were simply boiled longer causing the sugars to caramelize further. Although the dark ones are cooked a little longer, François explains that it’s really tied to when they harvest the sap: the earliest batches create the golden syrup while the last taps makes the very dark. Live and learn, who would have known that not only the terroir of the tree matters, but the timing as well? I must admit, now that a can of the amber Maple-in-a-Tree sits on my counter, I’m more inclined to trigger the tap and use the maple syrup (rather than having in jumbled with the multitude of other condiments in the fridge). 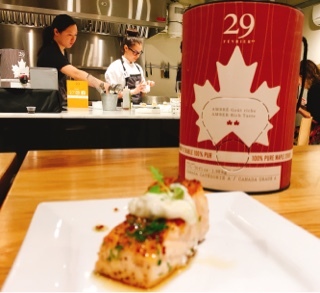 It’s a reminder of our Canadian staple and Février’s action against Alzheimer. Don’t forget the date.